One of the great highlights of Homecoming Weekend is the opportunity to celebrate the achievements of our alumni. 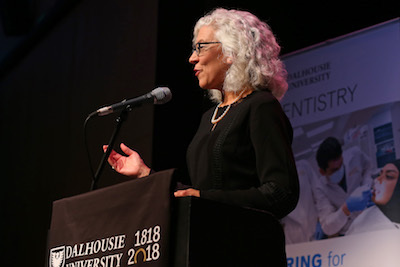 This year, in honour of Dal’s 200th anniversary celebrations, we presented Outstanding Alumni Awards to four individuals who have made “special or distinctive contributions to their community, profession, society at large, or the Faculty”. 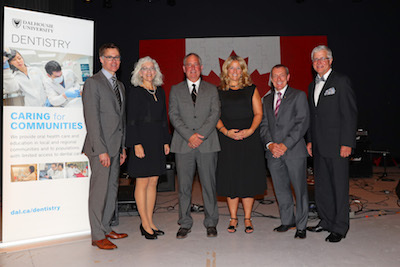 This year’s winners – Tom Boran, Susan Keating-Bekkers, Carol Anne Murdoch-Kinch, and Rick Raftus – ticked all those boxes – and more – with their outstanding achievements. Dean from 2008 to 2017, Dr. Tom Boran has been a part of the Faculty of Dentistry since 1974 when he was a first-year student. As dean, he was committed to teaching students, tirelessly supporting and promoting excellence in dentistry and dental hygiene education programs. Community outreach was also important to him, and he strived to improve access to care for marginalized populations. During his tenure as dean, he helped to raise more than $7 million to support the work of the Faculty and he led it to a Gies Award in 2012, the first time a Canadian dental school had been recognized in any category. Volunteer instructor, outreach supporter, and a passionate ambassador for greater access to care, Susan Keating-Bekkers is committed to helping vulnerable patients get the care they need, giving Faculty of Dentistry students a wide range of learning experiences and connecting the Dalhousie dental clinic to the wider community. Without Susan’s thoughtful and generous support, hundreds of people would be living without the oral health care they deserve. Dr. Murdoch-Kinch combines expertise and dedication excellence in teaching, research, and service. As associate dean for Academic Affairs at the University of Michigan – ranked the number 1 dental school in the US – she is widely recognized for her leadership in dental education. The University of Michigan recently honoured Dr. Murdoch-Kinch with an endowed chair: the Dr. Walter H. Swartz Faculty Professorship of Integrated Special Care Dentistry. She is currently establishing a new clinical centre for the care of patients with special care needs. Dr. Rick Raftus is devoted to his patients, his students, his community, and his profession. He has a passion for volunteerism and leads by example with his students. Respected for his excellence and enthusiasm in teaching, students seek him out for advice and recommendations and he is a valued mentor to many. Dr. Raftus has served the profession locally, provincially, and nationally and has selflessly supported students in their volunteer initiatives. The next Outstanding Alumni Awards will be presented in 2020. You can submit a nomination any time before the April 1, 2020 deadline to alumni.dentistry@dal.ca. For more information on how to make a nomination, please contact Melanie Bremner (melanie.bremner@dal.ca).